For this couple, the excitement of getting married at The Sutherland was matched only by their joy to be getting married. The Sutherland is located in Wake Forest, North Carolina and is one of Raleigh's most sought after wedding venues. An 18th century estate, the house is set on 6 acres of land, filled with natural beauty and some awesome backdrops. The venue has recently updated their outdoor venue site, enclosing the walls and adding air conditioning for those steamy summer days and heat for the colder winter months while allowing for opening the walls for those comfortable spring and fall weddings. Weddings at the venue are set just outside the side entrance to the house, with the couple surrounded by evergreens on the back and sides enclosed by a brick wall and their loved ones filling in the rest of the area in beautiful white seating. I had spent a lot of time with the bride and her friends that morning, before heading to the venue to greet the guys. All of the wedding had great personalities and were so fun to be around. Despite being on time in their arrival at the venue, a last minute wardrobe issue had delayed the bride in getting down the aisle by several minutes. We almost wondered if she had bolted out the front door. But alas, she made her grand entrance and look radiant walking down the aisle. The groom was spellbound when he first saw her, offering a silent "Wow!" heard only by those around him. The wedding ceremony was traditional. The couple paid homage to those loved ones who had past in previous years. The main aisle for this wedding split the seating and provided a great location to capture this image of the bride and groom leaving the ceremony as husband and wife for the first time while allowing some context to the surroundings and the beauty of the layout and venue. 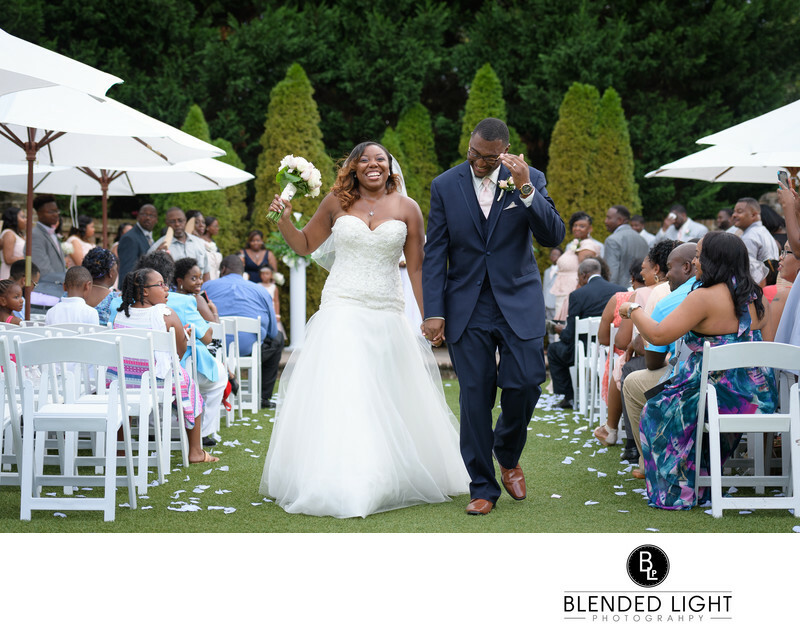 A typical hot NC summer wedding for a beautiful couple at a gorgeous location! Location: 13371 Wake Union Church Rd, Wake Forest, NC 27587.